This course will teach you the basics of setting up Windows 10 securely and how to get the most out of common features. Learn how to quickly and easily use the Start screen,download apps, customize your computer, add accounts, and enjoy all the latest features in no time. Welcome to ENRICH computer courses from the Library! Enrich classes are specifically designed for adult learners. You’ll receive a free workbook in each class. A computer is provided during class. 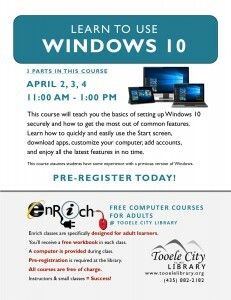 Pre-registration is required at the library. All courses are free of charge. Instructors & small classes = Success! Congratulations Lisa Carpenter “Friends of Public Health” Award! 2019 Junior Golf Programs – Registration Now Open! Sewer Lateral or Water Service Line Repair? Who is responsible?